Since astronomy is the study of various phenomena in the Universe, observations over a wide wavelength range are essential to understand their properties. Infrared astronomy has the second-longest history, after optical astronomy, and has proven very useful for providing new information. However, observations in at infrared wavelengths are not easy because infrared light is strongly absorbed by the earth's atmosphere. The TAO telescope is being built at the world highest site (5640m), where the atmosphere is exceptionally transparent even in the infrared. In the near-infrared wavelength range, discrete atmospheric “windows” called the J, H, K-bands coalesce into one continuous window at the TAO site. In addition, a new window from 25 to 40 microns appears in the mid infrared. The ability to work at these wavelengths is a unique capability for TAO and one of its strongest advantages. (Upper) Atmospheric transmittance at the Chajnantor TAO site (model) (Lower) Atmospheric transmittance at the Paranal site of the VLT 8m telescopes. The TAO site has a continuous window in the near infrared and a new window above 25 micron. To utilize this excellent observing environment, the TAO telescope has two state-of-the-art instruments called SWIMS and MIMIZUKU. SWIMS (Simultaneous-color Wide-field In- frared Multi-object Spectrograph) is an instrument optimized for near-infrared observations. It has a unique spectroscopic capability covering 0.9-2.5 micron continuously. This is very useful for observations of spectral lines in red-shifted galaxies. Its ability to perform simultaneous observations in two different wavelength bands, as well its wide field-of-view of 9.6’, enables us to carry out surveys with high efficiency, which is a key for studying galaxy evolution, cosmology, and searching for rare objects. NIR survey power of current and near future projects. X-axis indicates limiting magnitude of the survey, and y-axis indicates survey area. TAO covers a relatively wide and moderately deep area in this figure. Light at longer mid-infrared wavelengths is observed by the MIMIZUKU (Mid-Infrared Multi-mode Imager for gaZing at the UnKnown Universe) instrument. It covers a very wide wavelength range from 2 to 38 microns. The longer mid-infrared region from 26 to 38 microns is accessible only to TAO/MIMIZUKU. Thanks to its higher spatial resolution, compared to satellite telescopes in this wavelength range, MIMIZUKU is a very powerful tool for studying planet formation and the origin of materials. Furthermore, MIMIZUKU has a unique function of simultaneous observations of two discrete fields of view, which enables us to carry out accurate monitoring in the mid-infrared. Spatial resolution of space/groundbased mid-infrared facilities. TAO achieves the highest spatial resolution among current and near-future projects around 30 microns. There are many scientific projects available to the TAO telescope. The most important two are “Origin of Galaxies and the Universe” and “Origin of Planets and Materials”. When were galaxies born? How did they form their current structure? To answer these questions it is essential to understand the growth process of stellar populations throughout the evolutional history of a galaxy. A wide and deep survey of galaxies in near-infrared wavelengths is key to reveal this process statistically and to investigate the environmental effects on their evolution. Galaxies born in the early Universe (protogalaxies) are located extremely far away and moving away from us according to cosmic expansion. Light from these galaxies is shifted to longer, i.e., redder wavelengths (the "red shift") and normal optical light moves into infrared wavelengths. The transparent atmosphere in the near-infrared of the TAO site, and the wide field of view of TAO/SWIMS, enable us to carry out near-infrared surveys with high sensitivity and wide sky coverage. The main topics of research are: the process by which gas accumulates into protogalaxies, the history of star formation, and the study of stellar populations found only in the early universe, including infrared galaxies and sub-mm galaxies. Observation of the Paschen-alpha emission line in nearby galaxies is another important subject, since it is only accessible from the TAO site. 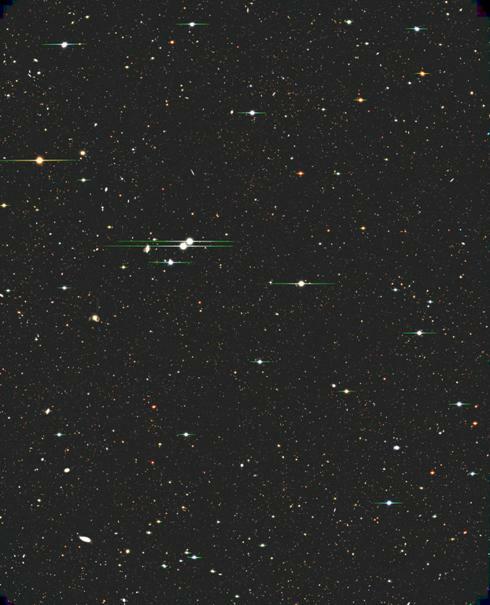 An optical image of the distant universe seen by the Subaru telescope. Most of bright spots correspond to distant galaxies. 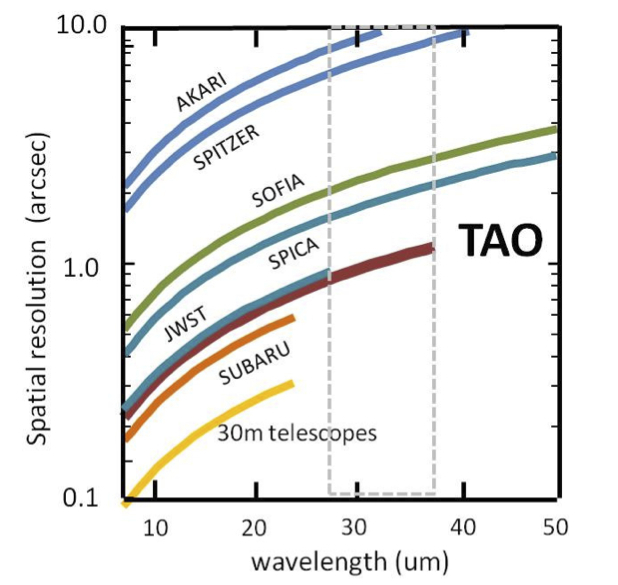 TAO will be able to obtain similar images of the distant universe at infrared wavelengths, and reveal their distances and characteristics by spectroscopic observations. Simulation of spectroscopic observations of high redshift quasars by TAO. The black curve shows the limiting magnitude with R=5,000 and an exposure time of 10,000 sec. Blue, green, and red curves indicate simulated spectra of quasars with z=3, 6, and 10, respectively. The shadowed range is the wavelength coverage of TAO spectroscopy. Recently, a lot of planets outside the Solar system (so called exoplanets) have been detected and studied intensively by many astronomers. The total number of the detected planets has reached over 3400 at the time writing in April 2017. Investigations of the details of the exoplanets, including their orbits, sizes, compositions, and atmospheres, are key for understanding the formation of (exo)planets and the (eventual) beginning of life. These planets are thought to be formed in dust disks around young stars, which are called pre-main-sequence stars. The dust disks, therefore, as well as the exoplanets themselves, are important targets for observation. The dust disks do not shine at optical wavelengths, but are very bright in the mid-infrared. The capability of 30-micron imaging by TAO is expected to reveal details of the formation process of planets for the first time. Dust grains are one of major constituents of the Universe. They contain most of metallic elements in the interstellar medium, and play important roles in physical and chemical processes in both interstellar and circumstellar environments. Studying the formation and the evolution processes of dust grains is essential to understand the cycle of matter in the Universe. 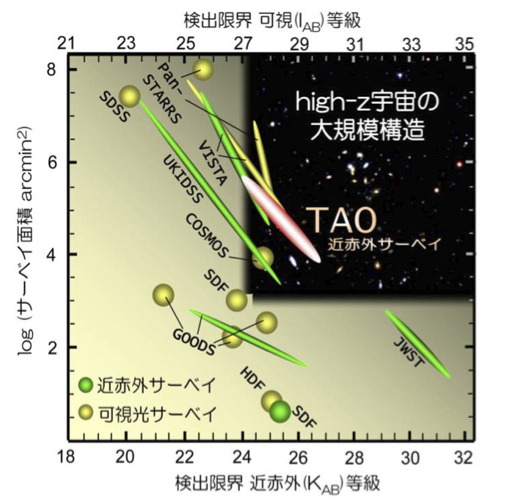 TAO is a quite powerful facility for observational studies of dust grains. Mid-infrared images of dust-creating stars with high spatial resolution obtained by TAO will provide us with precious information about the dust-forming process. Spectroscopy of stars in various evolutional stages will inform mineralogical and chemical studies of the dust grains as well as detailed studies of stellar physics. A cold and massive torus in the planetary nebula NGC6302 detected by miniTAO. Red (left) and green (right) contours show mid-infrared images obtained by miniTAO/MAX38 at 18 and 31 microns, respectively. The image at 31 microns has a relatively elongated shape, indicating that a colder dust torus exists at the central region of the nebula. The background picture is a narrow-band image at Pa-beta obtained by miniTAO/ANIR. 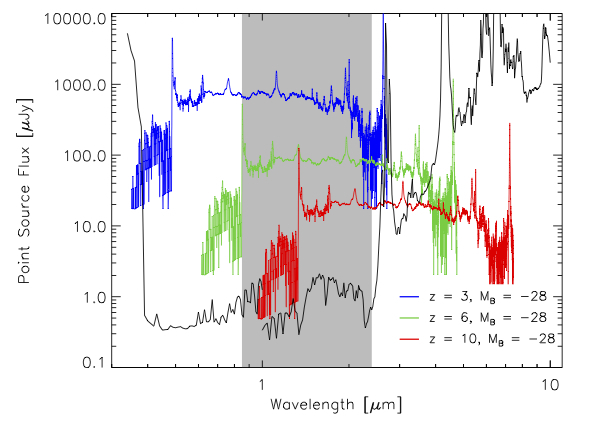 (Upper) Near-infrared spectra of Mira variables obtained by ISO/SWS. 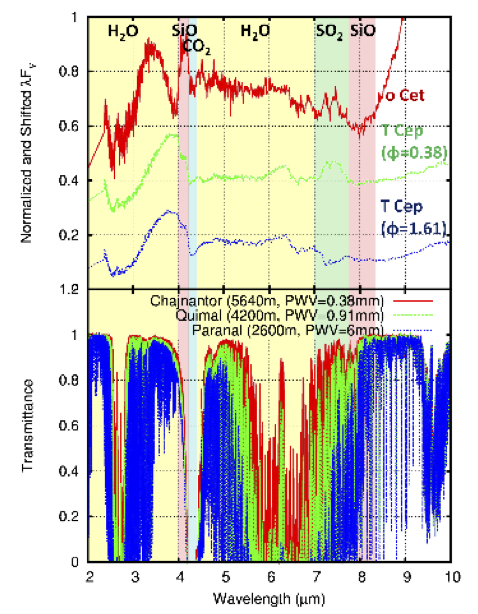 The red curve shows a spectrum of omi Cet, and the green and blue show spectra of T Cep at variable phases of 0.38 and 1.61, respectively. (Lower) Atmospheric transmittance at an altitude of 2600m (Paranal; blue), 4200m (Quimal; green), and 5640m (Chajnantor; red). In the upper panel, complex features corresponding to various molecules around stars can be seen. In order to carry out observational studies of these molecules, wide and continuous spectral coverage is absolutely needed.